Almost everyone has some sort of personal music player (phones, iPods, tablet devices – I have even see hats that can play your music). Listening to your music by yourself is fine, but what happens when you want to share your music with friends? 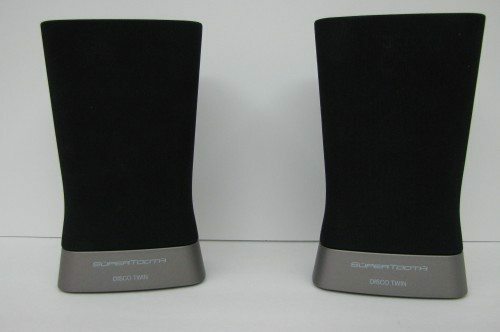 SuperTooth has added their latest entry into the portable speaker game with the Disco Twin Bluetooth speakers. 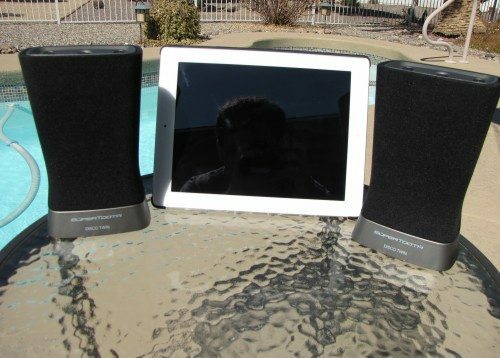 While there are many portable speaker options on the market for your portable devices, the field narrows when you look at Bluetooth options, and it gets even smaller when you want a true stereo setup. Add a rechargeable option to your requirements, and you are down to a handful of speakers at best. The first thing I noticed when the Disco Twin speakers arrived was the packaging. As you can see from the above picture the box not only has a nice carrying handle, it has spit front covers that open to reveal the Disco Twin speakers. The two front flaps are held closed by magnets embedded in either the box or the flaps. The box could be used to transport your Disco Twins if needed. What makes the Disco Twins unique is the fact that they are connected to each other via Bluetooth. 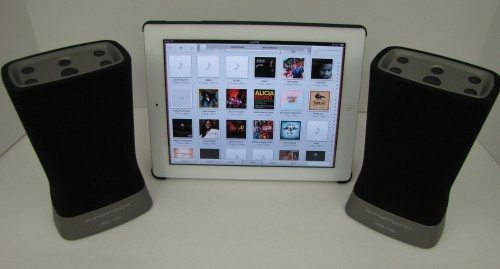 While a lot of portable speakers are connected to a music device via Bluetooth, I don’t think I have seen any speakers that also connect to each other via Bluetooth. (I may not be looking in the right places.) 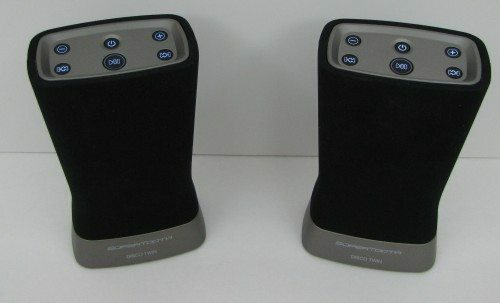 That Bluetooth connection allows users to space the speakers up to 32.8 feet (10 meters) apart, making a clearer separation of the left and right channels, and in my opinion, a nicer listening experience. I like the top buttons, as they allows you to make changes from either speaker you are near. 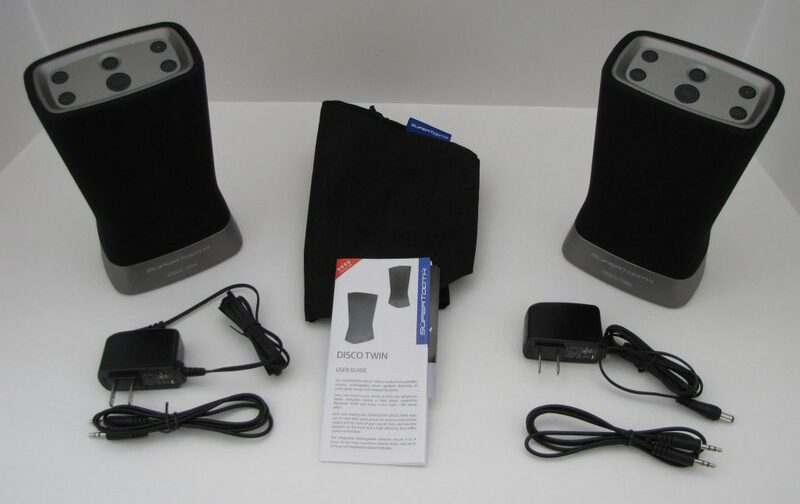 The rear of both speakers has a charge port, Bluetooth indicator, and a stereo line input. You will also see a “MASTER – LEFT” designation on the back of one speaker, which is the only way to tell the two speakers apart. The bottom of the speakers has the manufacturer’s tag with model and serial numbers; each speaker has a different serial number. 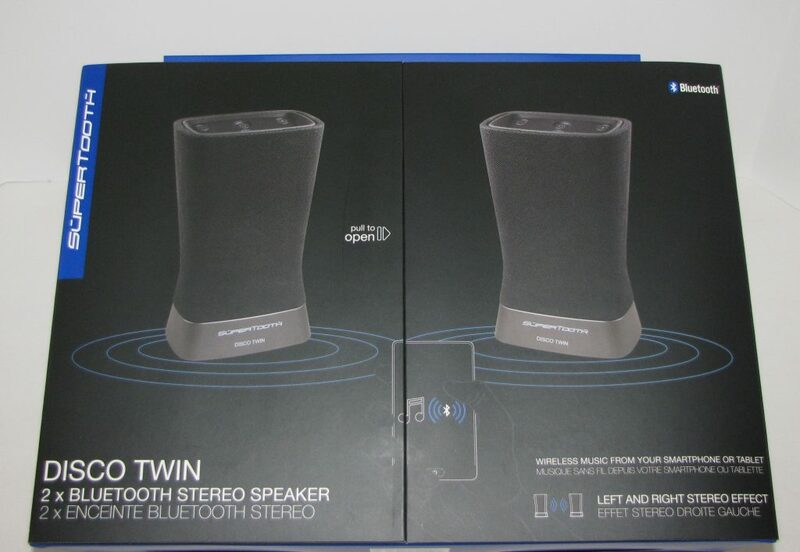 The Disco Twins should work with many Bluetooth devices. I tested them using my iPad 2 and a 7th generation iPod nano. 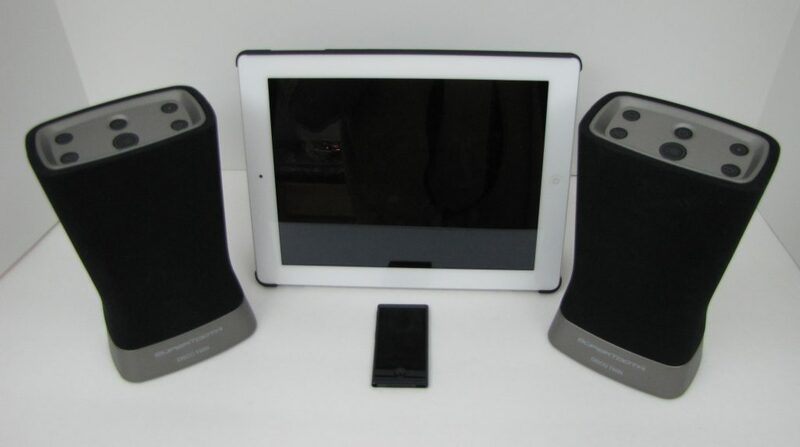 I chose these two devices because they are what I use for 90% of my music playing, and they have two different versions of Bluetooth; the iPad has Bluetooth 2.1 + EDR technology the iPod nano has Bluetooth 4.0. After unboxing the speakers (did I say I really liked the way the speakers were packaged?) and the accompanying accessories, I plugged the travel chargers into the speakers and my handy wall outlet to charge up the Ni-metal halide power packs. The SuperTooth website states that charging time is about two hours, but it only took about 45 minutes to get the green light (fully charged) on the speakers. The web site also says that the speakers have a 1500 hour standby time, 3-4 hour play time at high volume and 10 hours at medium volume. These times seem kind of ambiguous to me – what is “high volume” what is “medium volume”? But I can tell you at the levels I regularly played my music, I got 5+ hours of play time with the speakers. I never actually got a low battery indicator during a single play through, only after a few days of using the speakers without recharging them. The recharge times I had while using the speakers was never more than about one and a half hours. So how did they work and sound? I first paired the speakers with my iPad 2 following the included instructions. Pairing the two devices was simple and straightforward. Just as a note, the Disco Twins come already paired to each other, so you will only need to pair your music device with the left speaker. A nice feature of these speakers is that they verbally tell you when they are on and paired with each other for play. Although, you have to turn on the left and right speakers individually, both speakers power off when you turn off either of them. I did notice some quirkiness with the speakers throughout my testing, things like the speakers failing to pair with each other when both are initially turned on and the right speaker not playing any music when I paired a different music device with the left speaker. These issues are fairly minor to me, as I have learned to listen for the verbal indicator to tell me the speakers are paired. If they are not you just turn them off and then on again. The speakers should pair no matter which one is turned on first. After pairing my iPad to the Disco Twins I started going through a test of various music genres to see how the speakers sounded. I have a rather eclectic collection of music, including rock, jazz, classical, hip hop, country, and new age. I probably have some others not listed, but those are the main ones I listen to, so those are the types I used to evaluate the speakers. I will also say that originally I had my iPad and nano’s EQ settings on off. My first impression of the Disco Twins was that they sounded kind of tinny, so I tried a few different songs, and the results were pretty much the same. To be fair though, I usually listen to my music through high-end speakers or decent headphones, so that impression may just be personal. I did find when I turned on the EQ on the iPad or the nano and set it to the “Small Speaker” setting, the speakers had a much better, balanced sound. I did play with other EQ settings to get a better sound for different genres of music, but I found the “Small Speaker” setting worked best for overall use. To me, the overall sound clarity was clear and sharp throughout the volume range (loud and soft). I did not hear any distortion while I had the speakers at maximum volume. Channel separation was spot on as I listened to a lot of 60’s and early 70’s music that was mixed left and right channel. 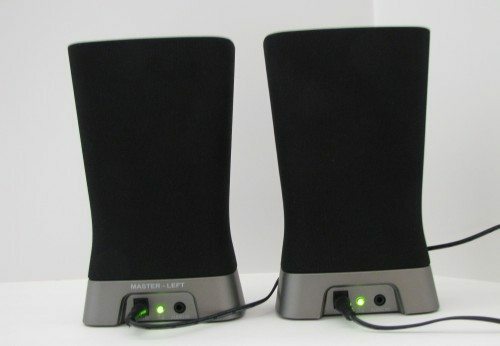 I used these speakers in a small space (my galley kitchen), a medium-sized space (my living room), and in my backyard to see how they would sound in different listening situations. In both indoor rooms, it was what I expected – a nice clear sound, with the music filling the rooms nicely. When I moved outside, I was very pleased with the sound. Being able to spread the speakers apart allowed me to hear the music throughout my backyard. 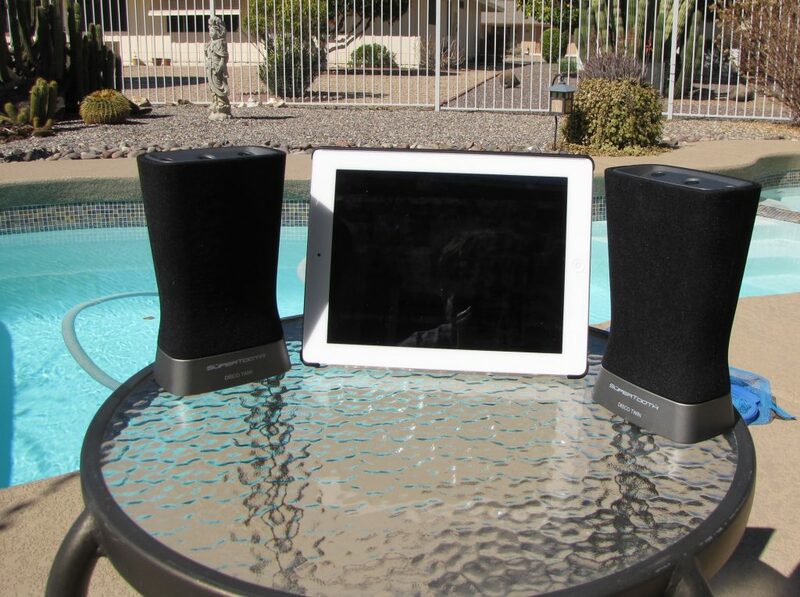 Compared to my current music solution for outdoor listening (a Sony CFD S250), these speakers are far superior. I did pair the speakers to my 7th-generation iPod nano to see if the newer version of Bluetooth would make any noticeable differences, but I did not notice any. So what’s my verdict on these speakers? 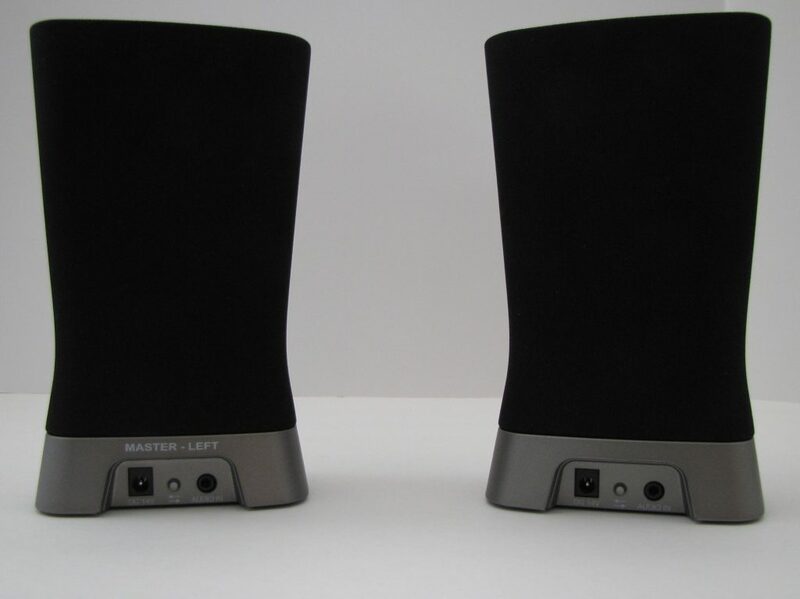 These speakers, in my opinion would be best for small to medium listening spaces where you want a listening solution with a lot of versatility. I think they would be great for college or even military personal living in a dorm type situation. Will they replace a full-blown pair of speakers? No. Will they offer you a more than acceptable listening experience via a Bluetooth-enabled device? Yes. At $199.00, they are a pricey option. But I think with the features and quality, the price is probably not out of line given the other solutions on the market today. Bluetooth-enabled device with Bluetooth A2DP or newer. After TRYING to read/look at the Disco Speaker pictures, only to be inundated at every other photo, with an ad for Windows phone 8 splayed across the pictures. SERIOUSLY?? every other pic in the article? I don’t come here to close ads at every other photo of a product review. I will now choose to view other product review sites that don’t run an ad at every other product picture. @john I think it is your browser serving up all the adds. I just clicked through all the pictures from this article and did not get any adds. I am currently using Apple’s Safari browser. I am sorry you are having issues. You may also want to turn on pop up blocker if you do not have it turned on.